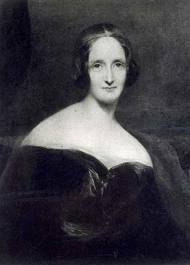 Mary Shelley research papers look into the English writer best remembered as the author of Frankenstein. Mary Shelley (1791-1851) was an English writer best remembered as the author of Frankenstein. Born Mary Wollstonecraft Godwin, her father, William Godwin, was a well-known philosopher. In 1814, the young Mary began a romantic relationship with one of her father’s friends, the poet Percy Bysshe Shelley. The much-older Shelley was still married when the two met, and for the next two years they traveled through Europe, largely ostracized from English society. They were only able to marry in 1816 following the suicide of Shelley’s wife. During the summer of 1816, the couple stayed with Lord Byron at his Lake Geneva, Switzerland, home. This is where Mary Shelley began writing Frankenstein. One can read excerpts on Literature.org. Frankenstein was first published anonymously. Editions published in 1818, 1823 and 1831 all differ, and modern publications are taken from the 1831 revision. Mary had her first three children die in infancy, events which depressed her. Their fourth child was the only one to survive childhood. In 1822, Percy Shelley drowned when his boat sank in a storm off the coast of Italy. Mary Shelley returned to England in 1823, and devoted her life to writing and raising her son. Her later years were marked by illness, and she died at the age of fifty-three, from what is believed to have been a brain tumor. Freudian Symbols in Frankenstein - Frankenstein by Mary Shelley contains many classic Freudian symbols that give the reader insights into the character of the monster and the man whom the monster represents Frankenstein. Paper Masters writes custom research papers on Mary Shelley and look into the English writer best remembered as the author of Frankenstein.